I am reading my way through the late Durwood Dunn’s final book, The Civil War in Southern Appalachian Methodism. It took me one sitting to read through half of the book and I am thoroughly enjoying it. Dunn did an incredible job running down obscure sources in order to recreate the environment of the Holston Conference during the Civil War. He set forth a simple argument, that the Civil War unveiled an internal civil war within the conference that had been waged for five decades prior to the war (p. xi). In addition to this, Dunn made it obvious through primary source documentation that the central issue that tore the country (and denomination) apart prior to the war, also played a part in tearing the conference apart. One issue of strife that Dunn points out was between local preachers and itinerant ministers on numerous issues. During the war, itinerant ministers came out in overwhelming support of the Confederacy. On pages 94-95, Dunn elaborates on that sentiment. The culmination of the melding of Southern nationalism and Holston Methodism occurred in the infamous annual conference held October 15-23, 1862 in Athens, Tennessee, a town midway between Chattanooga and Knoxville. The fire-eating Bishop John Early presided and completely dominated the proceedings. Later reports said that the assembled itinerants were surrounded by rebel soldiers and that no Union minister dared make the slightest protest against these obvious threats and blatant intimidation. The first order of business was to appoint a committee to investigate the political status of every suspicious character within this [Holston] conference to determine their absolute loyalty to the Confederate cause…. It is interesting to note that the committee and annual conference featured primarily itinerant ministers and other higher-ups in the Conference. Most of these men represented a Confederate support structure. Notice that they recognized slavery as a ‘positive good.’ They also acknowledge indirectly that the North’s supposed attacks on slavery is what led to both secession and war, and that both responses were appropriate. Local ministers were left out of the annual conference by design. Years of conflict and internal dispute between local preachers and itinerant ministers evolved over the years and left layer upon layer of tension within the conference. When the Civil War broke out, that internal strife exploded with the majority of local preachers coming out in support of the Union. 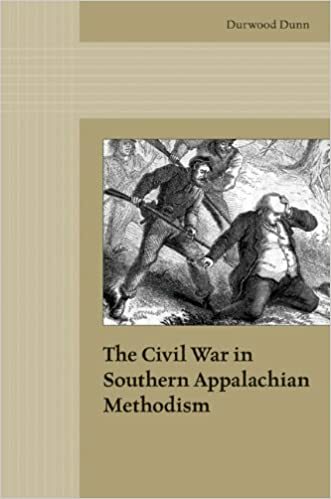 Anyways, this is an incredible work of scholarship and I highly recommend it to those interested in Civil War history, Appalachian history, and of course, Methodism. It sounds as though the higher-ups at the Holston Conference attempted to turn the war into a crusade of sorts by insinuating that the future of their church was at stake. Well, they are fighting over the soul of their church. If you want to bring people over to your side, what better way to do it than claim, justified or not, that your faith is at stake? Dunn’s initial premise, I think, hold true when he states that the Civil War that began in 1861 unveiled an existing civil war within the conference. In 1860, there were 127 itinerant preachers and 425 local preachers. You were likely to find more slaveowners in the former. In the schism of 1844-1845, itinerant preachers were in favor of the split over slavery and local preachers were mostly against. A caste system developed as time marched with an aristocratic itinerant at the top and local preachers at the bottom. Those local preachers, overwhelmingly unionist, were embedded in the community and were hard to touch. The committee focused on the more important unionist itinerants like Parson Brownlow.